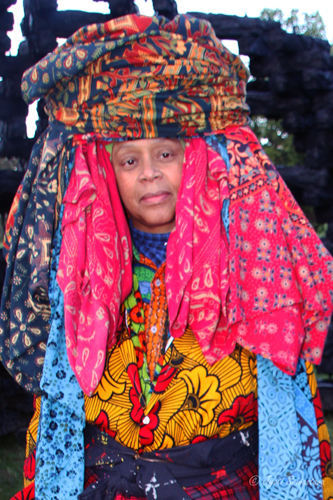 Chakaia Booker is instantly recognized with her signature headdress. 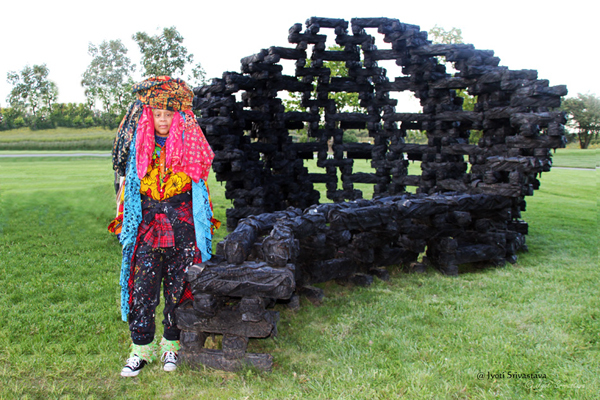 Her art career began in the 1980s with making wearable art. It was partly a result of family influences, and partly a way of resolving the issue of having long arms. The garments had to be deconstructed and reshaped to fit the needs. “The wearable garment sculpture was about getting energy and feeling from a desired design.” From early on she started used discarded materials – broken plates, wood, metals and household objects – to make sculptures. She also took a few classes in weaving. 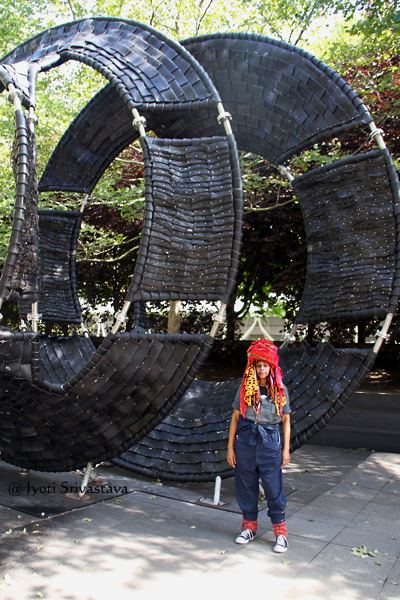 The strong influence of garment-stitching and basket-weaving can be easily seen in her sculptures. 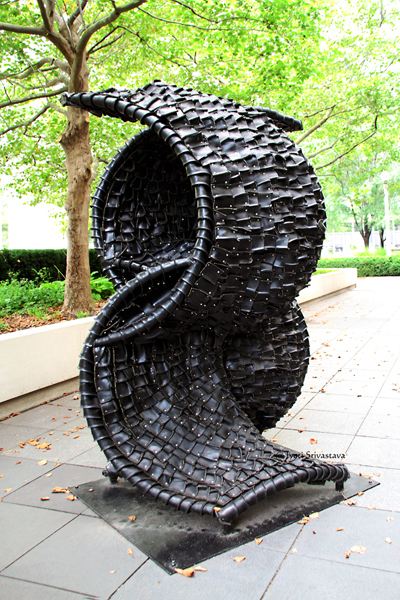 Booker began working with rubber tires in the early 1990s and presently continues to work in this medium. The various tread patterns, colors, and widths of the tires possess create a palette for Booker similar to the palette of painter. 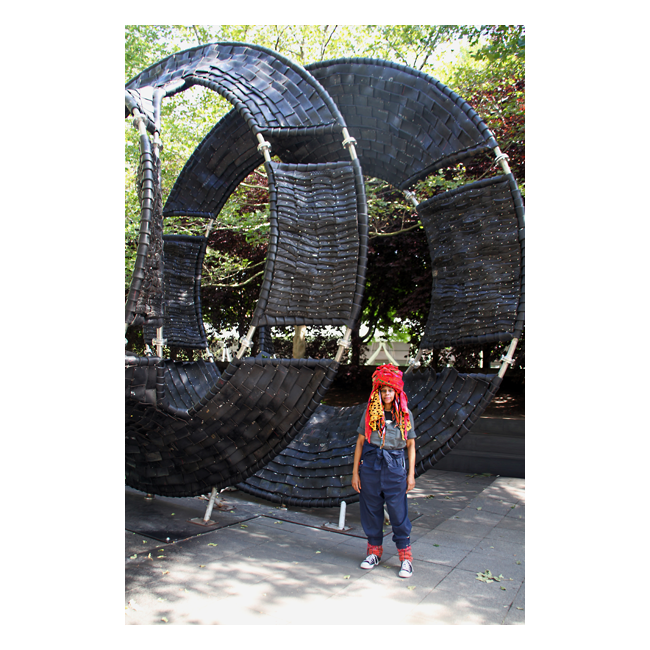 The tire also represents her socio-economic concerns of working class, factory labor in the industrial environment – the emotional and physical scarring of people. The black tires symbolize the strength of African American identity. 2014: 1004 Portraits – by Jaume Plensa.. click here..
2013: Legends, Myths and Truths – by Jun Kaneko.. click here..
2011-12: Interconnected – Sculptures of Yvonne Domenge .. click here..
2009-10: A Conversation with Chicago: Contemporary Sculpture From China.. click here..
2007-08: Sculptures by Mark di Suvero.. click here..
Before these there have been two photo exhibitions..
2005: Revealing Chicago: An Aerial Portrait by Terry Evans. 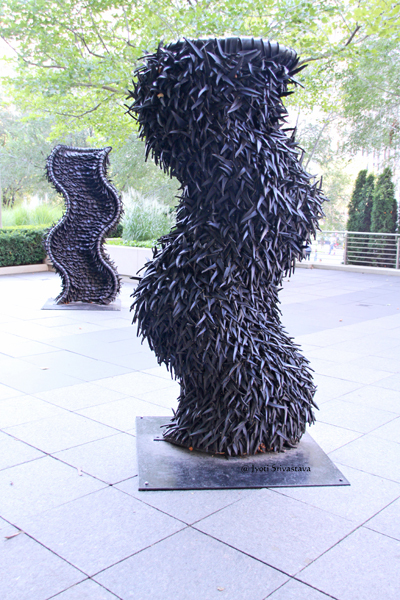 The Millennium Park exhibition marks the third exhibition by Chakaia Booker in Chicago. 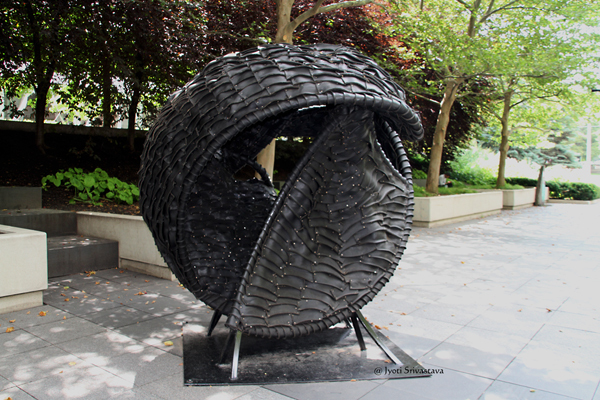 Solo exhibition “Don’t Tread on Me” at Nathan Manilow Sculpture Park… click here.. 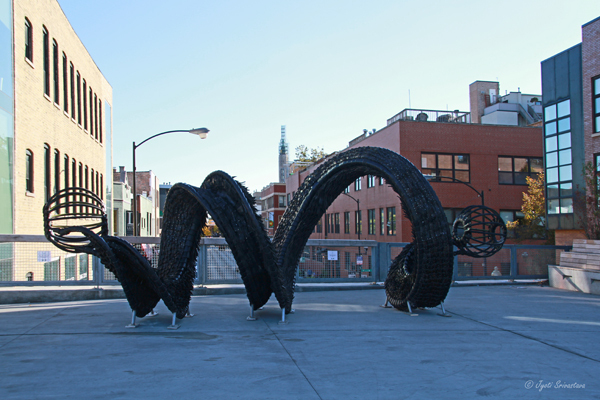 Brick House – by Chakaia Booker / Bloomingdale Trail at Damen. Brick House is the first in the series of temporary installations at Bloomingdale Trail, also known as 606.The piece was selected through an invitational process guided by a partnership between the Trust for Public Land, the Chicago Park District [CPD], and Chicago Department of Cultural Affairs and Special Events [DCASE]. For more.. click here.. 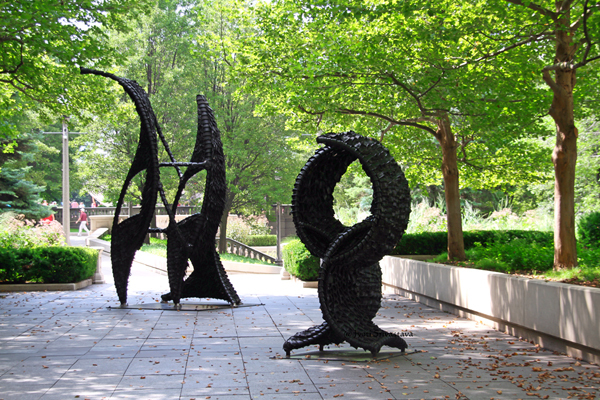 The Nathan Manilow Sculpture Park at Governors State University presents Solo Exhibition Series which brings exceptional artwork by nationally and internationally recognized artists to the park. 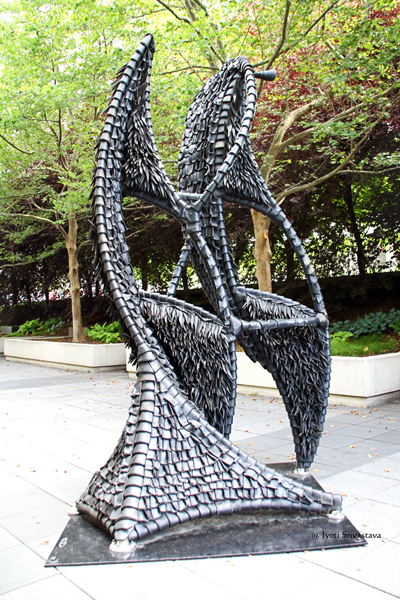 In 2014, Chakaia Booker’s “Dont Tread on Me” was launched at the park. It consists of three outdoor pieces: Serendipity , Meeting Ends  and What’s Not . 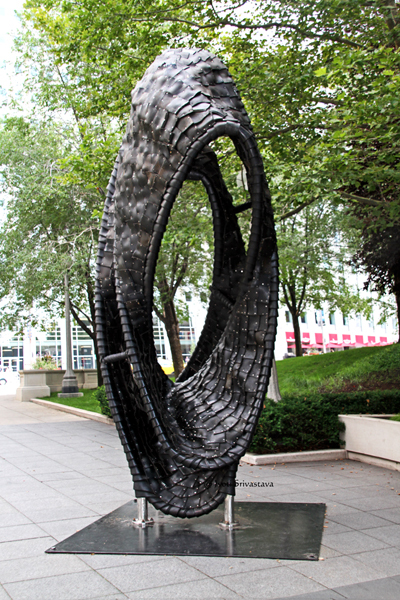 For more, click here..
Millennium Park: Rotating Exhibtions.. click here.. 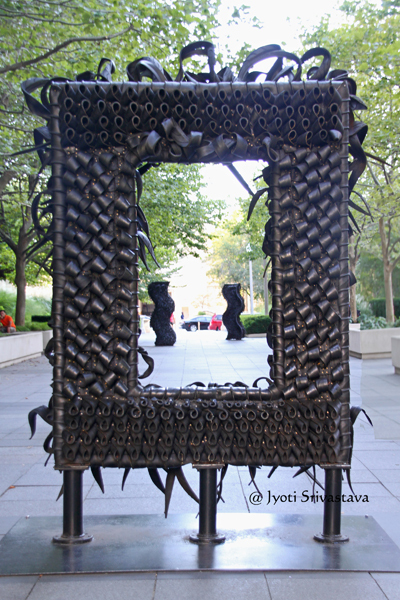 Brick House – by Chakaia Booker / Bloomingdale Trail .. click here..
Chakaia Booker at Nathan Manilow Sculpture Park.. click here..
Top Ten Cultural Institutions that bring Rotating Public Art to Chicago.. click here..